I consider my scrappy blanket to be potato chip knitting. You just have to see how that NEXT square looks with all the others. I too have plenty of sock yarn that shouldn't be socks. I didn't know in the beginning that you really need some nylon in there. 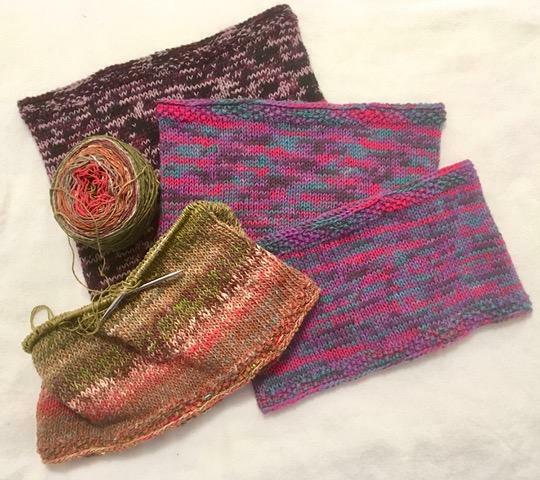 Some of it will be hats, but I may try one of those cowls too. Mittens are my potato chip Knitting. I have a whole bag of partial skeins of sock yarn though and I may end up making a blanket with that because I just can’t stand to see it not being used. Your cowls are great. It is now in my Rav favorites, and queue. 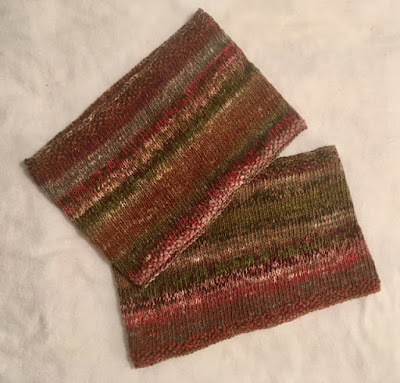 Thank You Nancy, I have some sock yarn just dying to become a cowl like this! I like the edge very much. I've done two vests from the same pattern, but with changes to the second , so that is my potato chip knit for now! Those are really pretty. Thanks for the pattern link. My potato chip knitting at the moment is my secret Christmas knitting. Good thing it is potato chip and not making me crazy - lol. I think the cowls are a great use for your sock yarn. Love the bit about the vertical stripes. Oh, I can see why you could just keep knitting these! I always appreciate your knitting choices. I've got a lot of leftover sock yarn. Maybe I'll try one of these smaller ones. I knit one once but it was scratchy and way to big. Sigh.